The Divine Muses Readings were established by Siobhan Harvey in 2004 to coincide with National Poetry Day. 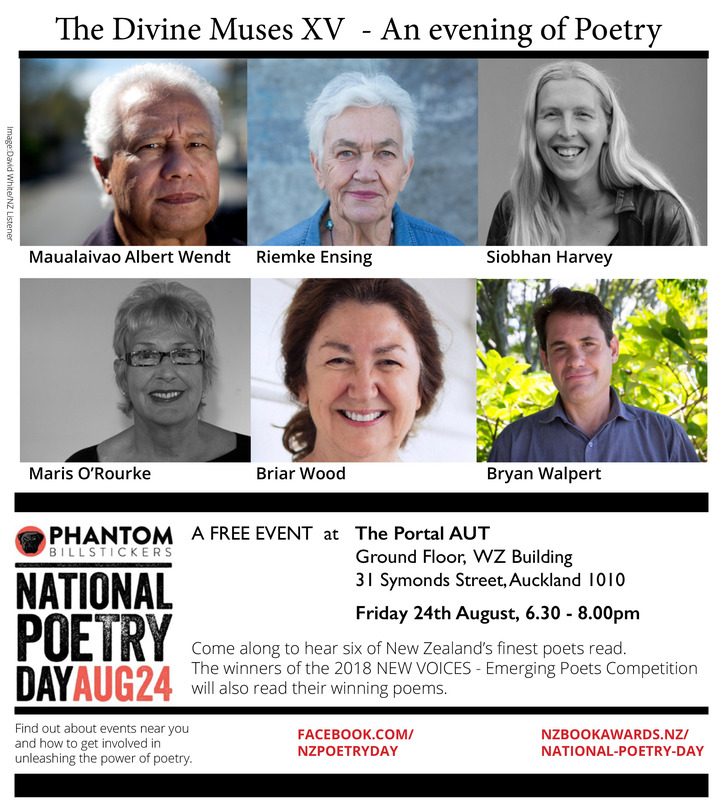 Now in its fifteenth year the evening provides an opportunity to hear leading New Zealand poets read their own poetry. Sue Wootton to join the Divine Muses 2018 Each year the Book Awards seeks out complimentary events to introduce the public to their finalists. Divine Muses is delighted to have been asked to take part and welcomes the Dunedin based poet to the evening reading. Wootton’s The Yield described as a “vivid and lyrical” new collection was shortlisted for this year’s Poetry Award. She will join's fellow finalist Briar Wood and will be the 7th poet to read. Towards the end of the evening the finalists of the 2018 NEW VOICES – Emerging Poets Competition will be announced and the winners will read their selected poem. Come along and join us and celebrate National Poetry Day. Born in Groningen, The Netherlands 1939, Riemke Ensing immigrated to New Zealand with her parents in 1951. After training and working as a teacher Ensing returned to fulltime studies, graduating with M.A. (Hons) in 1967. She then became a tutor in the English Department, University of Auckland, where she taught till 1999. In 2000 she was appointed as an Honorary Research Fellow (Faculty of Arts) at the University and in 2002 awarded a Buddle Findlay Sargeson Fellowship. In 1977 she was editor of the first New Zealand anthology of women poets, Private Gardens. Her first collection of poems, Letters was published in 1982. Since then there have been many publications, some small, some substantial. She has also collaborated with Tara McLeod of The Pear Tree Press on beautiful hand set and printed limited edition works. The latest If only (2017) was written in memory of her partner Bill Trussell. In 2012 she received the Lauris Edmond Memorial Award. In 2015, the 15th anniversary of Talking Pictures, editor Mark Pirie (HeadworX) featured her in broadsheet 15 “in honour of her contribution to NZ literature.” Her work is represented extensively in anthologies, journals, literary magazines both here and abroad. Ensing is currently working on poems for an exhibition on migration entitled Carving Water / Painting Voice to be shown at the Maritime Museum, Auckland in October. This will also feature the work of Kazu Nakagawa (sculptor), Helen Bowater (composer) and Andrew Caldwell (designer). A selection of her west coast poems entitled Watermarks is due for publication by the Janus Press, Vermont in 2019. 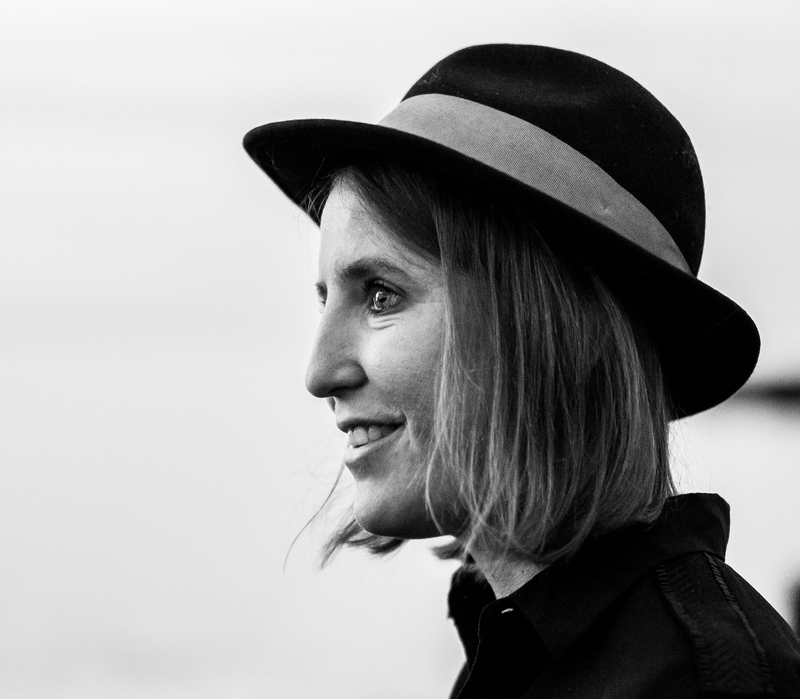 Siobhan Harvey is the author of five books, including the 2013 Kathleen Grattan Award winning poetry collection, Cloudboy (Otago University Press, 2014), and co-editor of Essential New Zealand Poems:Facing the Empty Page (Penguin Random House NZ), which was shortlisted for the 2015 PANZ Book Awards. Recently, her poetry, fiction and creative nonfiction have been published in Arc (Ca), Asia Literary Review (HK), Burnt Pine Magazine (US) Cordite (Aus), Griffith Review (Aus), Stand (UK) and the anthology, Manifesto Aotearoa: 101 Political Poems (Otago University Press). Winner of the 2016 Write Well Award (Fiction, US), she was shortlisted for the 2015 Janet Frame Memorial Award, runner-up in 2014 New Zealand Poetry Society International Poetry Competition, 2012 Dorothy Porter Poetry Prize (Aus), 2012 Kevin Ireland Poetry Competition and 2011 Landfall Essay Prize. She is a Lecturer in Creative Writing at The Centre for Creative Writing, Auckland University of Technology and works with The Poetry Project (Michael King Writers Centre) and New Zealand Book Council as a creative writing teacher in New Zealand schools. She is President of the New Zealand Society of Authors. The Poetry Archive (UK) holds a ‘Poet’s Page’ devoted to her work. 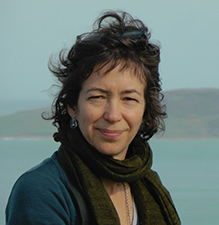 Dr Maris O’Rourke began writing in 2008 and since then has been well placed in a number of competitions including: Robert Burns, Caselberg, Kevin Ireland and Matariki. Her work has been published in a range of journals: Takahé, Poetry New Zealand (Guest Poet, Issue 44), Bravado, ‘a fine line’ (inaugural guest poet), Shot Glass Journal (USA), Otago Daily Times, International Literary Quarterly (UK), Side Stream, Tyneside Poets (UK), The Fib Review (USA), Flash Frontier and Landfall. She has also featured in a number of anthologies e.g. Essential New Zealand Poems:Facing the Empty Page, Starch Vol II and Taking Latin America Home. In 2013 O’Rourke’s first poetry collection Singing with Both Throats was published by David Ling Publishing to good reviews. In 2015 her poems Motherings won the coveted Kathleen Grattan Prize for a Sequence of Poems. She completed her Masters in Creative Writing with first class honours at Auckland University of Technology in 2015. O’Rourke is currently working on another children’s book, a poetry collection and a memoir with the working title Zig Zags and Leapfrogs. Bryan Walpert is a poet, fiction writer, scholar, essayist and editor. He is an Associate Professor in Creative Writing and Postgraduate Coordinator at the School of English and Media Studies at Massey University’s Albany Campus, Auckland. He has written three books of poems, a collection of stories and two monographs. His poetry collection, Native Bird (Makaro Press 2015) was praised by critics for its ‘sharp, self-deprecating awareness’, and was described as ‘one of those books where the poems reach out and hold you in the grip of attention’. His fiction collection, Ephraim’s Eyes, was named a Best Book of 2010 by Radio New Zealand and received praise for its ‘stories that resonate with compassion and insight’. His monograph, Resistance to Science in Contemporary American Poetry, was described as ‘an important contribution to the study of contemporary poetry and science’. His latest book, Poetry and Mindfulness: Interruption to Journey, argues for the value of studying poetry in an age of distraction. He has received, among other awards, the James Wright Poetry Award from the Mid-American Review and first prize in the New Zealand Poetry Society International Poetry Competition, and has twice been short-listed for the Montreal International Poetry Prize. Samoan born, novelist and poet, Maualaivao Albert Wendt has been an influential figure in New Zealand and Pacific literature since the 1970s. In 1988 he was appointed Professor of New Zealand and Pacific literature at Auckland University. Today as Emeritus Professor of English he continues to play a key role in fostering literature among Pacific nations and communities in New Zealand and abroad. He has published numerous novels, collections of poetry, short stories and edited a number of important anthologies of Pacific writing. Wendt and his work has been the recipient of many literary prizes. Awarded the Prime Minister’s Award for Literary Achievement in Fiction in 2012. He received New Zealand’s highest honour, the Order of New Zealand in 2013. The Arts Foundation of New Zealand made him an ICON, in 2018. Only 20 artists can hold this at any time. Briar Wood was born in Taumarunui, and grew up in South Auckland. She is an internationally published poet and an experienced creative writing teacher. Until 2012, she lived and worked as a lecturer in Britain, where she published poetry, fiction and essays. Returning to Northland places, where her Te Hikutu ki Hokianga, Ngãpuhi Nui whakapaka resonates with ecological concerns, she now combines occasional lecturing and a focus on writing. Her work has been published in numerous outlets, including the online Poetry Archive, and Ora Nui, a Mãori literary journal. Her recent collection of poems Rãwãhi was published by Anahera Press, 2017 and shortlisted for the 2018 Ockhams NZ Book Awards Poetry Prize. Sue Wootton lives in Dunedin. Her poetry, fiction and essays are widely published in New Zealand and internationally, and her work has been recognised in a number of awards and competitions, including the International Hippocrates Prize for Poetry and Medicine, the Caselberg Poetry Prize, the Gwen Harwood Poetry Prize, the University of Canberra Vice Chancellor’s Poetry Prize, the BNZ Katherine Mansfield Short Story Competition and the NZ Poetry Society International Competition. Her debut novel, Strip (Mãkaro Press), was longlisted for the fiction prize in the 2017 Ockham NZ Book Awards, and her fifth poetry collection, The Yield (Otago University Press) was a finalist in the poetry category of the 2018 Ockham NZ Book Awards. A physiotherapist-turned-writer, Sue is a PhD candidate at the University of Otago, researching the importance of literature to a holistic view of health and wellbeing. She edits a weekly Health Humanities e-magazine called Corpus: Conversations about Medicine and Life, found at corpus.nz and teaches creative writing in schools, universities and community settings. 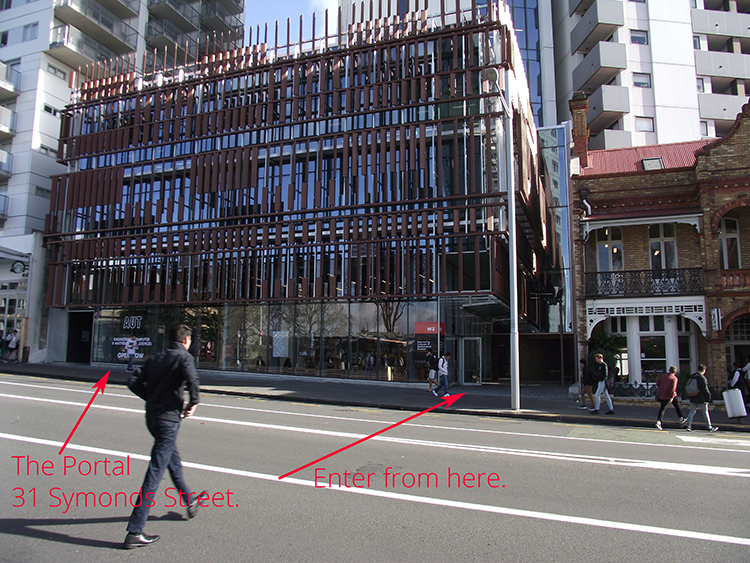 From a large Kiwi-Italian family Michael Giacon was born and raised in Auckland. He has worked at tertiary level in English language teaching, and graduated with a Master in Creative Writing from the Auckland University of Technology in 2016. As part of his studies he wrote Beyond Retrieve, a volume of poetry, about a life of writing, and was awarded the 2016 Kathleen Grattan Prize for a sequence of poems for Argento in no man land, which took shape during his studies. 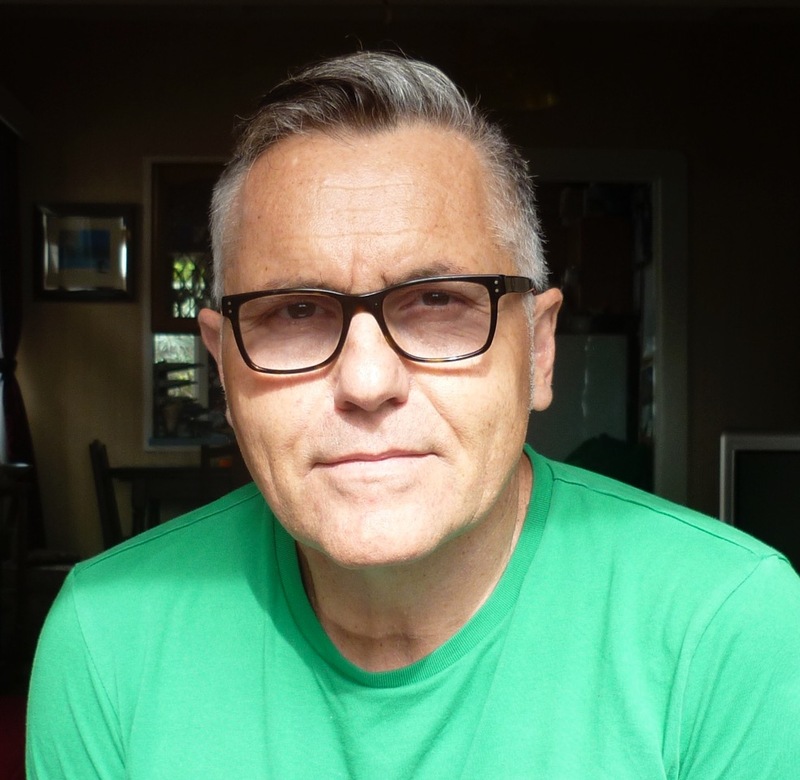 He has been published in brief, Fresh Ink, and Poetry in the Garden, a chap book from The Central Auckland Poets, of which he is a founding member. We are delighted that this years judge is someone at the helm who has experience of what it means to win the competition and the value of it to the career of emerging authors. Elizabeth Morton in an Auckland poet and short story writer she is published in the USA, UK, Ireland, Canada and Australia, as well as online. She was feature poet in the Poetry New Zealand Yearbook 2017. She is included in Best Small Fictions 2016, and has placed second, twice, in the Sunday Star-Times Short Story Competition. Her first poetry collection, Wolf, was published with Mãkaro Press in 2017.